Globally, 90% production of rice is in Asia, but Singapore is an exception to rice production and rice consumption. Singapore had 347,000 metric tons consumption of rice in 2017, which was completely imported from Vietnam, Thailand and India. For many decades Thailand had been major exporter of rice to Singapore but since 2013 India overtook Thailand. Singapore imports jasmine rice, Vietnamese rice and many others, but Vietnamese rice pose greater competition to supply of other varieties of rice in Singapore due to the use of advanced technology in its production that beats the Singapore standards. Moreover, Singapore is commercial hub for ASEAN and the trade of Vietnamese rice to Philippines, Indonesia and African markets enters through Singapore, becoming a vital trade country for Vietnam. Singaporeans do not have high demand for rice, they prefer various other dishes. The tourists in Singapore with distinct taste and preference are the major consumers of rice. Therefore the growth in Singapore travel and tourism industry and food services industry are majorly driving the growth of Singapore rice industry. Additionally, in recent years the street eateries and restaurants have begun to buy rice, a price efficient alternative to sustain in the era of rising prices, is another factor inducing the demand for rice in Singapore. Goldstein Research analyst estimates that the Singapore rice industry was valued at USD 168.39 million and is expected to grow at CAGR of 1.9% over the forecast period. The factors such as growing rice consumers, rising importers of rice, mounting travel and tourism industry and food services industry are majorly impacting the growth of Singapore rice industry. The report covers the present ground scenario and the future growth prospects of the rice industry for 2017-2025 along with the Singapore rice production and revenue of Singapore rice industry. We calculated the market size and revenue share on the basis of revenue generated from major players involved in rice processing across Singapore. We have forecast the market on the basis of producers, suppliers and distributors, exporters and importers. On the basis of rice variety, aromatic rice accounted for largest market share in 2017 with 63.8% of total imported rice. Over the forecast period aromatic rice is expected to continue their dominance in the imports of rice varieties. Further, import of Indica rice market share has increased in the total rice imported from Vietnam and India and it is expected to grow at a CAGR of 1.3% over the forecast period. Singapore rice industry outlook 2017-2025, has been prepared based on an in-depth market analysis from industry experts. 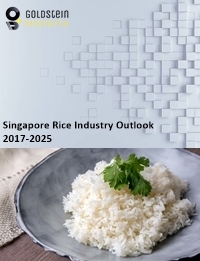 The report covers the competitive landscape and current position of major players in the Singapore rice industry. The report also includes porter’s five force model, SWOT analysis, company profiling, business strategies of market players and their business models. Singapore rice industry report also recognizes value chain analysis to understand the cost differentiation to provide competitive advantage to the existing and new entry players. In the era of technology advancement, there is trend of producing genetically modified (GM) rice to ascertain the quality of rice and food security. Though commercially there is no production of GM rice, but many varieties have been approved for commercial production that is expected to be imported by Singapore. Rice is a staple crop for 70% of the world and thus the demand for rice is expected to continue to grow over the forecast period. The food security concerns all over the world is driving the growth of the Singapore rice industry, which being an ideal hub for international rice futures market due to stable government, developed infrastructure and trading capacity, is thus expected to help in achieving food security, keeping affordable prices for poor consumers of rice. Singapore Rice industry report comprises of the following companies as the key players in the Rice industry: Kubota Rice Industry (SGP) Pte Ltd, Singvina PTE LTD, Saachi Singapore Pte. Ltd., Centuria International, Midfa, Global RiTrader, Dashmesh Singapore PTE. LTD.